You don’t need a ton of different movements and techniques to improve your squat. Here are the most effective ways to do it. 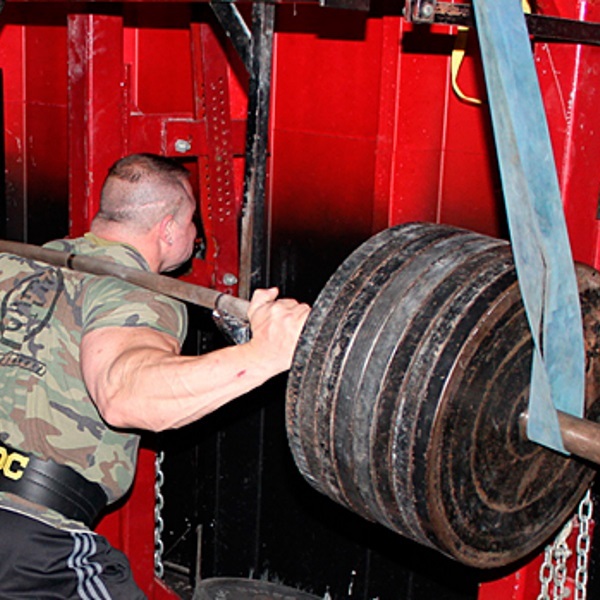 Your body adapts to the demands placed on it, so if you want to improve your squat you better be squatting. The back squat can actually be trained very frequently, almost daily, with two to three times a week being ideal for most people. Those who say you can’t squat that frequently don’t understand proper programming. Luckily for them, there’s a sample training block below. The reverse band squat provides an overload effect allowing you to get a feel for handling more weight. Basically, the bands assist you at the bottom of the squat but “it’s all you, bro” as you near the top coming back up. All you need is a set of bands and a power rack. Choose a band tension that’ll allow you to handle around 15-20% over your max back squat at the top. If your max squat is 425, use a band tension that’ll allow you to squat between 490 and 510. It doesn’t have to be exact. Squats with reverse bands can be trained with a variety of reps, anywhere between 1-10 reps.
Chains provide the reverse effect: the squat gets harder as you come back up. It’s another great option if you have access to the equipment. More info HERE. Take a full two-second pause, below parallel. There’s nothing better for building strength in the hole. By pausing in the hole you take away the benefit of the stretch reflex at the bottom of the squat, making it much harder. Adjust the pins of the power rack so that when the bar is setting on the pins you’re just below parallel. The goal during the eccentric portion is to control the weight so that the bar is set lightly on the pins at the bottom, no clanging or bouncing allowed. This effort to set the bar on the pins lightly will help you build great control of the weight as well as increase time under tension, both of which develop strength. Once you get the bottom, deload the weight fully onto the pins, but don’t allow the bar to come completely off of your back. After a quick pause on the pins, explode up. Training without a belt also prepares us for real life. When the zombie apocalypse comes and you have to put something heavy on your back and lift it, you’re probably not going to have a squat belt with you. Aim to leave at least 1-2 reps in the tank. Keep the reps between 3-10. Many lifters actually find it easier to perform higher rep squats without a belt because it’s easier to breath between reps. You can perform any of the four exercises above without a belt. Autoregulation means letting your body tell you if you need an easier training day or if it’s a day to try for a PR. This takes some practice. You must listen to your body, not your brain that says, “I need to hit a PR today.” There are two ways to autoregulate. Here’s a four-week training block designed to increase size and strength. Squatting can be done with higher frequency, so for this program you’ll squat three times per week using a different rep range and movement each day. The workouts should be performed on non-consecutive days, so Monday, Wednesday, Friday, etc. Remember, to improve your squat, train the squat! You can’t be wishy-washy about it. Train it often, but use autoregulation to keep you fresh, recovered, and consistent.